England is the largest and most populous constituent country of the United Kingdom, occupying most of the southern two-thirds of the island of Great Britain. It shares land borders with fellow home nations Scotland, to the north, and Wales, to the west. Elsewhere, it is bordered by the sea. England is named after the Angles, one of a number of Germanic tribes believed to have originated in Angeln in Northern Germany, who settled in England in the 5th and 6th centuries. It has not had a distinct political identity since 1707, when Great Britain was established as a unified political entity; however, it has a legal identity separate from those of Scotland and Northern Ireland, as part of the entity "England and Wales". England's largest city, London, is also the capital of the United Kingdom. The name "England" is often used incorrectly to refer to the entire United Kingdom by those unfamiliar with the complicated statutory makeup of the nation. This can sometimes cause annoyance or offence amongst those Britons who do not come from England. Archaeological evidence indicates that what is now southern England was colonised by humans long before the rest of the British Isles due to its more hospitable climate between and during the various ice ages of the distant past. The first historical mention of the region is from the Massaliote Periplus, a sailing manual for merchants thought to date to the 6th century BC, although cultural and trade links with the continent had existed for millennia prior to this. Pytheas of Massilia wrote of his trading journey to the island around 325 BC. Later writers such as Pliny the Elder (quoting Timaeus) and Diodorus Siculus (probably drawing on Poseidonius) mention the tin trade from southern England but there is little further historical detail of the people who lived there. Tacitus wrote that there was no great difference in language between the people of southern England and northern Gaul and noted that the various tribes of Britons shared physical characteristics with their continental neighbours. Julius Caesar visited southern England in 55 and 54 BC and wrote in De Bello Gallico that the population of southern England was extremely large and shared much in common with the other Iron Age tribes on the continent. Coin evidence and the work of later Roman historians has provided the names of some of the rulers of the disparate tribes and their machinations in what was to become England. Surprisingly few historical sources describe Roman England. For example, we have only one sentence describing the reasons for the construction of Hadrian's Wall. The Claudian invasion itself is well attested and Tacitus included the uprising of Boudicca, or "Boadicea," in 61 in his history. Following the end of the 1st century, however, Roman historians only mention tantalising fragments of information from the distant province. The Roman presence strengthened and weakened over the centuries, but by the 5th century Roman influence had declined to such a point that the peoples who were to become the English were emerging. In the wake of the Romans, who had abandoned the south of the island by 410 in order to concentrate on more pressing difficulties closer to home, what is now England was progressively settled by successive and often complementary waves of Germanic tribesmen. These Germanic tribes first came when they were invited by Vortigern, King of the Britons, as mercenaries to help the Britons during their wars against the Irish and the Picts. The prevailing view is that waves of Germanic people, Jutes together with undoubtedly large numbers of Frisians and Ripuarian Franks, Saxons from northern Germany and Angles from what is now Denmark - commonly known as Anglo-Saxons - who had been partly displaced on mainland Europe, invaded Britain again around the middle of the 6th century. They came under military leaders and settled on the eastern shore. They are believed to have fought their way westward up the River Thames, looking for more land to cultivate, taking lowland and leaving less desirable lands in the hills to the Celtic Britons. Research suggests that Celtic Britain underwent a form of ethnic cleansing in some parts of the country by Anglo-Saxon invaders following the Roman withdrawal in the 5th century. However, Professors John Davies and A.W. Wade-Evans believe that the Saxons did not sweep away the entire population of the Celtic Britons in the areas they overran, as was supposed by 19th century historians. Population estimates based on the size and density of settlements put Britain's population at about 3.5 million by the time Romans invaded in A.D. 43. Many historians now believe subsequent invaders from mainland Europe had little genetic impact on the British. The notion that large-scale migrations caused drastic change in early Britain has been widely discredited, according to Simon James, an archaeologist at Leicester University, England. For the English, their defining period was the arrival of Germanic tribes known collectively as the Anglo-Saxons. Some researchers suggest this invasion consisted of as few as 10,000 to 25,000 peoplenot enough to displace existing inhabitants. Analysis of human remains unearthed at an ancient cemetery near Abingdon, England, indicates that Saxon immigrants and native Britons lived side by side. "Probably what we're dealing with is a majority of British people who were dominated politically by a new elite," Miles said. "They were swamped culturally but not genetically." "It is actually quite common to observe important cultural change, including adoption of wholly new identities, with little or no biological change to a population," Simon James, the Leicester University archaeologist, writes. Increasingly, the Romano-British population (the Britons) was assimilated, a process enabled by a lack of clear unity amongst the British people against a unified armed foe, and the culture pushed westwards and northwards. The settlement (or invasion) of England is known as the Saxon Conquest or the Anglo-Saxon (sometimes "English") Conquest. In 495, at the Battle of Mount Badon (Badbury rings, Latin Mons Badonicus, Welsh Mynydd Baddon) near the Roman Porchester-Southampton-Poole road, Britons inflicted a severe defeat on an invading Anglo-Saxon army. While it was a major political and military event of the 5th and 6th centuries in Britain, there is no certainty about who commanded the opposing forces. This victory by the British army made it possible to stop the Saxon invasion and secured a long period of peace for Celtic Britain. In the decisive Battle of Deorham, in 577, the British people of Southern Britain were separated into the West Welsh (Cornwall and Devon) and the Welsh by the advancing Saxons. By the 4th century AD, many Britons had escaped across the English Channel from Wales, Cornwall and southern Britain, with their chiefs, soldiers, families, monks and priests, and started to settle and colonize the west part (Armorica) of Gaul (France) where they founded a new nation: Brittany. This flow of Britons increased when Roman troops and authority were withdrawn from Britain, and raiding and settling by Anglo-Saxons and Scotti into Britain increased. The immigrant Britons gave their new country its current name and contributed to the Breton language, Brezhoneg, a sister language to Welsh and Cornish. The name Brittany (from "Little Britain") arose at this time to distinguish the new Britain from "Great Britain". Brezhoneg (the British language) is still spoken in Brittany in 2005. Beginning with the raid in 793 on the monastery at Lindisfarne, Vikings made many raids on England. At Dore (now a suburb of the City of Sheffield) Egbert of Wessex received the submission of Eanred of Northumbria in 829 and so became the first Saxon overlord of all England. After a time of plunder and raids, the Vikings began to settle in England and trade, eventually ruling the Danelaw from the late 9th century. One Viking settlement was in York, called Jorvik) by the Vikings. Viking rule left significant traces in the English language; the similarity of Old English and Old Norse led to much borrowing. The principal legacy left behind in those territories from which the language of the Britons were displaced is that of toponyms. Many of the place-names in England and to a lesser extent Scotland are derived from the Britons' names, including London, Dumbarton, York, Dorchester, Dover and Colchester. Several place-name elements are thought to be wholly or partly Brythonic in origin, particularly bre-, bal-, and -dun for hills, carr for a high rocky place, coomb for a small deep valley. Until recently it has been believed that those areas settled by the Anglo-Saxons were uninhabited at the time or the Britons had fled before them. However, genetic studies show that the British were not pushed out to the Celtic fringes  many tribes remained in what was to become England (see C. Capelli et al. 'A Y chromosome census of the British Isles'. Current Biology 13, 979984, (2003)). Capelli's findings strengthen the research of Steven Bassett of Birmingham University; his work during the 1990s suggests that much of the West Midlands was only very lightly colonised with Anglian and Saxon settlements. The defeat of King Harold Godwinson at the Battle of Hastings in 1066 at the hands of William of Normandy, later styled William I of England and the subsequent Norman takeover of Saxon England led to a sea-change in the history of the small, isolated, island state. William ordered the compilation of the Domesday Book, a survey of the entire population and their lands and property for tax purposes. Henry I, also known as "Henry Beauclerc" (so named because of his educationas his older brother William was the heir apparent and thus given the practical training to be king, Henry received the alternate, formal education), worked hard to reform and stabilise the country and smooth the differences between the Anglo-Saxon and Anglo-Norman societies. The loss of his son, William, in the wreck of the White Ship in November 1120, was to undermine his reforms. This problem regarding succession was to cast a long shadow over English history. During the disastrous and incompetent reign of Stephen (1135 - 1154), there was a major swing in the balance of power towards the feudal barons, as civil war and lawlessness broke out. In trying to appease Scottish and Welsh raiders, he handed over large tracts of land. His conflicts with his cousin The Empress Matilda (also known as Empress Maud), whom he had earlier promised recognition as heir, were his undoing: she bided her time in France and, in the autumn of 1139, invaded (with her husband, Geoffrey of Anjou and her half-brother, Robert of Gloucester). Stephen was captured and his government fell. Matilda was proclaimed queen but was soon at odds with her subjects and was expelled from London. The period of insurrection and civil war that followed continued until 1148, when Matilda returned to France. Stephen effectively reigned unopposed until his death in 1154, although his hold on the throne was still uneasy. When Stephen's son and heir apparent Eustace died in 1153 Stephen reached an accommodation with Matilda which allowed her son, Henry of Anjou, (who became Henry II) to succeed Stephen and in which peace between them was guaranteed. The Black Death, an epidemic of bubonic plague that spread over the whole of Europe, arrived in England in 1349 and killed perhaps up to a third of the population. International excursions were invariably against domestic neighbours: the Welsh, Irish, Cornish, Scots and the French, with the principal notable battles being the Battle of Crécy and the Battle of Agincourt. In addition to this, the final defeat of the uprising led by the Welsh prince, Owen Glendower, in 1412 by Prince Henry (later to become Henry V) represents the last major armed attempt by the Welsh to throw off English rule. Edward III gave land to powerful noble families, including many people with Royal blood in their veins. Because land was equivalent to power in these days, this meant that these powerful men could now try to make good their claim to the Crown. The autocratic and arrogant methods of Richard II only served to alienate the nobility more, and his forceful dispossession in 1399 by Henry IV sowed the seeds for what was to come. In the reign of Henry VI, which began in 1422, things came to a head because of his personal weaknesses and mental instability. Unable to control the feuding nobles, he allowed outright civil war to break out. The conflicts are known as the Wars of the Roses and although the fighting was very sporadic and small, there was a general breakdown in the authority and power of the Crown. Edward IV went a little way to restoring this power but the spadework was generally done by Henry VII. The Wars of the Roses culminated in the eventual victory of the relatively unknown Henry Tudor, Henry VII, at the Battle of Bosworth Field in 1485, where the Yorkist Richard III was slain, and the succession of the Lancastrian House was ultimately assured. Whilst in retrospect it is easy for us to date the end of the Wars of the Roses to the Battle of Bosworth Field, Henry VII could afford no such complacency. Before the end of his reign, two pretenders would try to wrest the throne from him, aided by remnants of the Yorkist faction at home and abroad. The first, Lambert Simnel, was defeated at the Battle of Stoke (the last time an English King fought someone claiming the Crown) and the second, Perkin Warbeck, was hanged in 1499 after plaguing the King for a decade. In 1497, Michael An Gof led Cornish rebels in a march on London. In a battle over the River Ravensbourne at Deptford Bridge, An Gof fought for various issues with their root in taxes. On June 17, 1497 they were defeated, and Henry VII had showed he could display military prowess when he needed to. But, like Charles I in the future, here was a King with no wish to go "on his travels" again. The rest of his reign was relatively peaceful, despite a slight worry over the succession when his wife Elizabeth of York died in 1503. King Henry VIII split with the Roman Catholic Church over a question of his divorce from Catherine of Aragon. Though his religious position was not at all Protestant, the resultant schism ultimately led to England distancing itself almost entirely from Rome. A notable casualty of the schism was Henry's chancellor, Sir Thomas More. There followed a period of great religious and political upheaval, which led to the Reformation, the royal expropriation of the monasteries and much of the wealth of the church. The Dissolution of the Monasteries had the effect of giving many of the lower classes (the gentry) a vested interest in the Reformation continuing, for to halt it would be to revive Monasticism and restore lands which were gifted to them during the Dissolution. Henry VIII had three children, all of whom would wear the Crown. The first to reign was Edward VI of England. Although he showed the piety and intelligence which was the hallmark of all Tudors, he was only a boy of ten when he took the throne in 1547. His uncle, Edward Seymour, 1st Duke of Somerset tampered with Henry VIII's will and obtained letters patent giving him much of the power of a monarch in March of that year. He took the title of Protector. Whilst some see him as a high-minded idealist, his stay in power culminated in a crisis in 1549 when many counties of the realm were up in protest. Kett's Rebellion in Kent and the Prayer Book Rebellion in Devon and Cornwall simultaneously created a crisis during a time when invasion from Scotland and France were feared. Somerset, disliked by the Regency Council for his autocratic methods, was removed from power by John Dudley, who is known as Lord President Northumberland. Northumberland proceeded to adopt the power for himself, but his methods were more conciliatory and the Council accepted him. When Edward VI lay dying of tuberculosis in 1553, Northumberland made plans to place Lady Jane Grey on the throne and marry her to his son, so that he could remain the power behind the throne. His putsch failed and Mary I took the throne amidst popular demonstration in her favour in London, which contemporaries described as the largest show of affection for a Tudor monarch. Mary, a devout Catholic who had been influenced greatly by the Catholic King of Spain and Holy Roman Emperor, Charles V, tried to reimpose Catholicism on the realm. This led to 274 burnings of Protestants, which are recorded especially in John Foxe's Book of Martyrs. She was highly unpopular among her people, and the Spanish party of her husband, Philip II caused much resentment around Court. Mary lost Calais, the last English possession on the Continent, and became increasingly more unpopular (except among Catholics) as her reign wore on. She successfully repelled a rebellion by Sir Thomas Wyatt. The reign of Elizabeth restored a sort of order to the realm following the turbulence of the reigns of Edward and Mary when she came to the throne following the death of the latter in 1558. The religious issue which had divided the country since Henry VIII was in a way put to rest by the Elizabethan Religious Settlement, which created the Church of England in much the same form we see it today. Much of Elizabeth's success was in balancing the interests of the Puritans (extreme Protestants) and "die-hard" Catholics. She managed to offend neither to a large extent, although she clamped down on Catholics towards the end of her reign as war with Catholic Spain loomed. Elizabeth maintained relative internal peace apart from the Revolt of the Northern Earls in 1569, which was really a sign of how effective she was being in reducing the power of the old nobility and expanding the power of her government. One of the most famous events in English martial history occurred in 1588 when the Spanish Armada was repelled by Sir Francis Drake, but the war that followed was very costly for England and only ended after Elizabeth's death. Elizabeth's government did much to consolidate the work begun under Thomas Cromwell in the reign of Henry VIII, that is in expanding the role of the government and in effecting common law and administration throughout the realm of England. In all, the Tudor period is seen as a decisive one which set up many important questions which would have to be answered in the next century and during the English Civil War. These were questions of the relative power of Monarch and Parliament and to what extent one should control the other. Some historians think that Thomas Cromwell effected a "Tudor Revolution" in government and it is certain that Parliament became a lot more important during his Chancellorship. Other historians say the "Tudor Revolution" really extended to the end of Elizabeth's reign when the work was all consolidated. Although the Privy Council, which was the mainstay of Tudor government, declined after the death of Elizabeth, whilst she was alive it was very effective. A number of assassination attempts were made on the Protestant King James I, notably the Main Plot and Bye Plots of 1603, and most famously, on 5th November 1605, the Gunpowder Plot, by a group of Catholic conspirators, led by Guy Fawkes, which was stoked up and served as further fuel for antipathy in England to the Catholic faith. The First English Civil War broke out in 1642, largely as a result of an ongoing series of conflicts between the then King, Charles I, and Parliament. The defeat of the Royalist army by the New Model Army of Parliament at the Battle of Naseby in June 1645 effectively destroyed the King's armies. The King fled to Scotland but was handed over to the English Parliament for money by the Scots. He escaped and the Second English Civil War began, although it was to be only a short conflict, with Parliament quickly securing the country. The capture and subsequent trial of Charles I led to his execution by beheading in January 1649 at Whitehall Gate in London. The monarchy was abolished and Oliver Cromwell became the Lord Protector. After he died, his son Richard Cromwell acceeded him as Lord Protector, but soon abdicated. The monarchy was restored in 1660, after England entered a period of anarchy, with King Charles II returning to London. In 1664/65 England was swept by a visitation of the Great Plague, and then, in 1666, London, the timbered capital city of England, was swept by the Great Fire of London, which raged for 5 days, destroying approximately 15,000 buildings. In 1689, the Dutch Protestant William of Orange, William III replaced the Catholic King James II. This became known as the Glorious Revolution or 'Bloodless Revolution'. However, in Scotland and Ireland, Catholics loyal to James II were not so content, and a series of bloody uprisings resulted. These Jacobite Rebellions continued until the mid-18th century. The late 18th and early 19th centuries saw considerable social upheaval as a largely agrarian society was transformed by technological advances and increasing mechanisation, which was the Industrial Revolution. Much of the agricultural workforce was uprooted from the countryside and moved into large urban centres of production, as the steam-based production factories could undercut the traditional cottage industries, due to economies of scale and the increased output per worker made possible by the new technologies. The consequent overcrowding into areas with little supporting infrastructure saw dramatic increases in the rise of infant mortality (to the extent that many Sunday schools for pre working age children (5 or 6) had funeral clubs to pay for each others funeral arrangements), crime, and social deprivation. The transition to industrialisation was not wholly seamless for workers, many of whom saw their livelihoods threatened by the process. Of these, some frequently sabotaged or attempted to sabotage factories. These saboteurs were known as "Luddites". This view of the Luddite history should also be set against alternative views, such as that of E. P. Thompson. The Act of Union of 1801 formally assimilated Ireland within the British political process, and created a new country "The United Kingdom of Great Britain and Ireland", uniting England, Wales, Ireland and Scotland. Since then England has not existed as an independent political entity, but as a region it has remained highly dominant in the United Kingdom. The majority of the political and economic leadership the UK is English. London has remained the economic and centre of Britain and one of the world's great cities. During the early 19th century, the working classes began to find a voice. Concentrations of industry led to the formation of guilds and unions, which, although at first suppressed, eventually became powerful enough to resist. Chartism is thought to have originated from the passing of the 1832 Reform Bill, which gave the vote to the majority of the (male) middle classes, but not to the 'working class'. Many people made speeches on the 'betrayal' of the working class and the 'sacrificing' of their 'interests' by the 'misconduct' of the government. In 1838, six members of Parliament and six workingmen formed a committee, which then published the People's Charter. The revolutions which spread like wildfire throughout mainland Europe during the 1840s did not occur in England and Queen Victoria's reign was largely one of consensus, despite huge disparities in living standards between the few rich and the multitudinous poor. The Anglo-Irish treaty of 1921 established the Irish Free State (now the Republic of Ireland) as a separate nation, leaving Northern Ireland as part of the United Kingdom; its official name became "The United Kingdom of Great Britain and Northern Ireland". England bore the full brunt of German bombing during World War II, many of its cities were badly damaged and huge amounts of infrastructure destroyed. England rapidly recovered after the war, and while internationally the relative wealth and power of Britain have faded, England still remains paramount in the British Isles. 1999 saw the establishment of the Scottish Parliament and Welsh Assembly. There is no English equivalent. In part this is a reflection of the hold England has on the British government. Since the promulgation of the 1284 Statute of Rhuddlan and the Acts of Union 1536-1543, Wales has shared a legal identity with England as the joint entity of England and Wales. The Act of Union with the Kingdom of Scotland in 1707 created the Kingdom of Great Britain, subsuming England, Wales and Scotland into a single political entity. Scotland, along with Northern Ireland, retains separate legal systems and identities. The duchy of Cornwall also retains some unique rights. All of Great Britain has been ruled by the government of the United Kingdom since that date, although in 1999 the first elections to the newly created Scottish Parliament and National Assembly for Wales left England as the only part of the Union with no devolved assembly or parliament. As all legislation for England is passed by Parliament at Westminster there are some complaints about the ability of non-English Members of Parliament to influence purely English affairs. This apparent anomaly has been highlighted by both English and non-English politicians, often those opposed to devolution, and has become popularly known as the West Lothian question. Administratively, England is something of an anomaly within the UK. Unlike the other three nations, it has no local parliament or government and its administrative affairs are dealt with by a combination of the UK government, the UK parliament and a number of England-specific quangos, such as English Heritage. There are calls from some for a devolved English Parliament and from others for the dissolution of the UK and an independent England. The current Labour government favoured the establishment of regional administration, claiming that England was too large to be governed as a sub-state entity. A referendum on this issue in North East England on 4 November 2004 decisively rejected the proposal. Some criticised the English regional proposals for not decentralising enough, saying that they amounted not to devolution, but to little more than local government reorganisation, with no real power being removed from central government. The English regions would not even have had the limited powers of the Welsh Assembly, much less the tax-varying and legislative powers of the Scottish Parliament. Rather, power was simply re-allocated within the region, with little new resource allocation and no real prospects of Assemblies being able to change the pattern of regional aid. Responsibility for regional transport was added to the proposals late in the process. This was perhaps crucial in the North East, where resentment at the Barnett Formula, which delivers greater regional aid to adjacent Scotland, was a significant impetus for the North East devolution campaign. There has also been a campaign for a Cornish assembly along Welsh lines by groups such as Mebyon Kernow, which recently collected 50,000 signatures in support. Some eurosceptics believe that the establishment of English regions as administrative entities is designed to undermine the concept of English nationhood and more easily fit England into a European federal model. Conventionally the national capital of England is London, although technically it would be more exact to call London the capital of "England and Wales" given England's lack of a distinctive political identity separate from the Principality. Winchester served as the country's first national capital until some time in the late 11th century after the Norman Conquest. The City of London became England's commercial capital, while the City of Westminster (where the royal court was located) became the political capital. These roles have, broadly speaking, been maintained to the present day. Historically, the highest level of local government in England was the county. These divisions had emerged from a range of units of old, pre-unification England, whether they were Kingdoms, such as Essex and Sussex; Duchies, such as Yorkshire, Cornwall and Lancashire or simply tracts of land given to some noble, as is the case with Berkshire. Until 1867, they were subdivided into smaller divisions called hundreds. These counties all still exist in, or near to, their original form as the traditional counties. In many places, however, they have been heavily modified or abolished outright as administrative counties. This came about due to a number of factors. The fact that the counties were so small meant, and still means, that there was no regional government able to coordinate an overarching plan for the area. This was especially true in the metropolitan areas surrounding the cities, as the county lines were usually drawn up before the industrial revolution and the mass urbanisation of England. The solution was the creation of large metropolitan counties centred on cities. These were later broken up, with several other counties, into unitary authorities, unifying the county and district/borough levels of government. London is a special case, and is the one region which currently has a representative authority as well as a directly elected mayor. The 32 London boroughs and the Corporation of London remain the local form of government in the city. Outside London the regions have very little power and are not accountable to elected representatives; regional authority is placed in the hands of unelected assemblies. If, as now seems unlikely, regions opt to replace these bodies with elected assemblies, local government in England will remain as variable and, some might say, as confusing as ever! England comprises the central and southern two-thirds of the island of Great Britain, plus offshore islands of which the largest is the Isle of Wight. 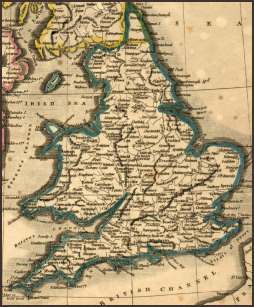 It is bordered to the north by Scotland and to the west by Wales. It is closer to continental Europe than any other part of Britain, divided from France only by a 38 km (24 statute mile or 21 nautical mile) sea gap. Most of England consists of rolling hills, but it is more mountainous in the north with a chain of low mountains, the Pennines, dividing east and west. The dividing line between terrain types is usually indicated by the Tees-Exe line. There is also an area of flat, low-lying marshland in the east, much of which has been drained for agricultural use. The list of England's largest cities is much debated because in British English the normal meaning of city is "a continuously built-up urban area"; these are hard to define and various other definitions are preferred by some people to boost the ranking of their own city. London is by far the largest English city. Manchester and Birmingham vie for second place. A number of other cities, mainly in the north of England, are of substantial size and influence. These include: Liverpool, Leeds, Newcastle, Nottingham, Bristol and Sheffield Using the standard U.S. city limits definition of a city the top six are: Birmingham, Leeds, Sheffield, Bradford, Liverpool and Manchester. Note that London is not on this list (Greater London is a region and the City of London is tiny), and that one of the two candidates for the status of England's "second city", Manchester, is down in sixth. In the UK, this method of ranking cities is generally used only by people whose own city is promoted by it. The Channel Tunnel, near Folkestone, links England to the European mainland. The English/French border is halfway along the tunnel. The highest temperature ever recorded in England is 38.5 °C (101.3 °F) on August 10, 2003 in Kent. The lowest temperature ever recorded in England is -26.1 °C (-15 °F) on January 10, 1982 in Shropshire. The simplest view is that an English person is someone who is from England and holds British nationality, regardless of his or her racial origin. However, it is quite commonplace to hear inhabitants of England refer to themselves as "British" rather than "English"; centuries of English dominance within the United Kingdom has created a situation where to be English is, as a linguist would put it, an "unmarked" state, (i.e. a British person, institution, custom, city, etc. is assumed English unless specified otherwise). The English frequently include their neighbours in the general term "British" while the Scots and Welsh, proud of their separate identities, tend to be more forward about referring to themselves by one of those more specific terms. Although currently a part of England, a notable percentage of those living in Cornwall feel similarly, considering themselves Cornish first. One significant exception is in Northern Ireland, where the Unionist community tend to identify very strongly as "British" (Republicans living in the province are more likely to consider themselves "Irish"), and there is not a "Northern Ireland" or "Northern Irish" identity to the same extent as there is (e.g.) a Scottish one. A person, therefore, using the term "English" to describe him or herself (regardless of personal history) may be going out of his or her way to do so; hence he or she may also be seen (rightly or wrongly, and not necessarily pejoratively) as nationalistic. While Scottish, Welsh, Irish and Cornish patriotism are widely exhibited, specifically English patriotism has often been viewed with suspicion, and most English people feel more comfortable identifying themselves with Britain as a whole. However, this may be to avoid being seen as bullies by their neighbours. The extent to which specifically English patriotism is linked to a right-wing xenophobic agenda has also generated discomfort. The appropriation of English symbols by racist far-right organisations such as the National Front made many people uncomfortable with expressions of Englishness. In recent years, English identity has recently been a topic of debate in the national press, with many English people trying to "reclaim" the term and the flag from the far-right. See English nationalism. The success of the England football team in the early 21st Century has seen a revival of the use of the "St George's Cross" and it now seems that efforts to reclaim the flag from the far right are being successful. While it has not yet replaced the "Union Flag" its use is far, far greater than at the end of the 20th Century. Many English people who have spent a lot of time overseas fall into the habit of referring to themselves as "English". It is the most recognisable designation by speakers of many languages, especially where their own language uses a similar word. Even in other English-speaking countries, people are often perplexed by concepts of "British" or the "United Kingdom of Great Britain and Northern Ireland". All these distinctions are only possible because there is no "English citizenship" or legal definition of Englishness. Moreover, the hazy understanding many people have of the distinction between "England" and "Britain" compounds the confusion. If in doubt, refer to an "English" person as "British", since this will be correct even if not as precise. English art is a term referring to a vast body of art originating from the geographical region presently referred to as England. This results in the term being almost indefinable, although Nikolaus Pevsner attempted a definition in his 1956 book The Englishness of English Art. It has developed over millennia to several current movements, such as Brit art, and encompasses all forms - painting, sculpture and performance art. Famous English artists presently working range from Lucian Freud and Damien Hirst. Oil painting came comparatively late to England. Hans Holbein, an imported talent, is generally credited with founding an English school of portrait painting. The rich ecclesiastical decoration of English churches was, in great measure, lost during the iconoclasm of the Reformation. And although Charles I of England built up a great royal collection of art, the disposal of these treasures during the English Commonwealth and the subsequent democratisation of society meant that the patronage of the state never formed great palace collections such as seen in other European states. It is often considered that English landscape painting typifies English art, mirroring as it does the development of the country house and its landscaping. England being the first industrialised country in the world, urbanised workers were in many cases cut off from regional food traditions. As a result, English cuisine has suffered from a widespread image of blandness and lack of distinctiveness. The openness of English diners to exotic dishes has also meant that English cooking does not enjoy as high a profile as other nation's culinary traditions. The Full English breakfast remains an enduring tradition for many, despite the increasing popularity of the continental-style breakfast, or no breakfast at all, for busy workers. Tea and beer are typical drinks. Cider is produced in the West Country, and the south of England has seen the reintroduction of vineyards producing high quality white wine on a comparatively small scale. English folklore is the folk tradition which has evolved in England over a number of centuries. Some English legends can be traced back to their roots, even as far as before the Roman invasion of Britain, while the origin of others is fairly uncertain or disputed. England abounds with folklore, in all forms, from such obvious manifestations as the traditional semi-mystical Arthurian legends and semi-historical Robin Hood tales, to contemporary urban myths and facets of cryptozoology such as the Beast of Bodmin Moor. Morris dance and related practices such as the Abbots Bromley Horn Dance preserve old English folk traditions, as do Mummers Plays. The utopian vision of a traditional England is sometimes referred to as Merry England. English mythology is no longer widely believed. Whereas some folklore legends were formerly believed nationally across the whole of England, most can generally be divided into regional areas of England. Stonehenge holds an iconic place in the culture of England. Other built structures like cathedrals and parish churches are associated with a sense of Englishness. The English country house and the lifestyle associated for centuries with an élite minority now forms an interest among many people in England as typified by visits to properties managed by English Heritage or the National Trust. The term English literature refers to literature written in the English language, or literature composed in English by writers who are not necessarily from England. Joseph Conrad was Polish, Robert Burns was Scottish, James Joyce was Irish, Edgar Allan Poe was American, Salman Rushdie is Indian: all have enriched English literature. But writers noted for expressing Englishness, or associated particularly with regions of England, include William Shakespeare, Charles Dickens, Thomas Hardy (Wessex), A. E. Housman (Shropshire), Rupert Brooke, Jane Austen, Arnold Bennett. England has a long and rich musical history. The United Kingdom has, like most European countries, undergone a roots revival in the last half of the 20th century. English music has been an instrumental and leading part of this phenomenon, which peaked at the end of the 1960s and into the 1970s. The achievements of the Anglican choral tradition following on from 16th century composers such as Thomas Tallis, John Taverner and William Byrd have tended to overshadow instrumental composition. The semi-operatic innovations of Henry Purcell did not lead to a native operatic tradition, but George Frederick Handel found important royal patrons and enthusiastic public support in England. The rapturous receptions afforded by audiences to visiting musical celebrities such as Haydn often contrasted with the lack of recognition for home-grown talent. However, the emergence of figures such as Edward Elgar and Arthur Sullivan in the 19th century showed a new vitality in English music. Ralph Vaughn Williams and others collected English folk tunes and adapted them to the concert hall. Cecil Sharp was a leading figure in the English folk revival. Finally, a new beat out of Liverpool emerged in 1962. The Beatles , John Lennon, Paul McCartney, George Harrison and Ringo Starr, became the world's most popular musicians of all time. The "Fab Four" opened the doors for British acts such as The Rolling Stones, The Who, and Led Zeppelin to the globe. The Church of England functions as the established church in England. Other churches which have started in England include the Methodist church, the Quakers and the Salvation Army. As its name suggests, the English language, today spoken by hundreds of millions of people around the world, originated as the language of England, where it remains the principal tongue today (although not officially designated as such). An Indo-European language in the Germanic family, it is closely related to Scots, Frisian and Low Saxon. As the Anglo-Saxon kingdoms merged into England, "Old English" emerged; some of its literature and poetry has survived. Used by aristocracy and commoners alike before the Norman Conquest (1066), English was displaced in cultured contexts under the new regime by the Norman French language of the new Anglo-French aristocracy. Its use was confined primarily to the lower social classes while official business was conducted in a mixture of Latin and French. Over the following centuries, however, English gradually came back into fashion among all classes and for all official business except certain traditional ceremonies. (Some survive to this day.) But Middle English, as it had by now become, showed many signs of French influence, both in vocabulary and spelling. During the Renaissance, many words were coined from Latin and Greek origins; and more recent years, Modern English has extended this custom, being always remarkable for its far-flung willingness to incorporate foreign-influenced words. The law does not recognise any language as being official, but English is the only language used in England for general official business. The other national languages of the UK (Welsh, Irish Gaelic and Scottish Gaelic) are confined to their respective nations, and only Welsh is treated by law as an equal to English (and then only for organisations which do business in Wales). The only non-Anglic native spoken language in England is the Cornish language, a Celtic language spoken in Cornwall, which became extinct in the 19th century but has been revived and is spoken in various degrees of fluency by around 3,500 people. This has no official status (unlike Welsh) and is not required for official use, but is nonetheless supported by national and local government under the European Charter for Regional or Minority Languages. Cornwall County Council has produced a draft strategy to develop these plans. There is, however, no programme as yet for public bodies to actively promote the language. Scots is spoken by some adjacent the Anglo-Scottish Border. Most deaf people within England speak British sign language (BSL), a sign language native to Britain. The British Deaf Association estimates that 70,000 people throughout the UK speak BSL as their first or preferred language, but does not give statistics specific to England. Like Cornish, BSL has no official status, but has been granted a degree of recognition by the government. The BBC broadcasts several of its programmes with BSL interpreters. Different languages from around the world, especially from the former British Empire and the Commonwealth of Nations, have been brought to England by immigrants. Many of these are widely spoken within ethnic minority communities, including Punjabi, Hindi, Urdu, Bengali, Gujarati, Chinese and Vietnamese. These are often used by official bodies to communicate with the relevant sections of the community, particularly in big cities, but this occurs on an "as needed" basis rather than as the result of specific legislative ordinances. Despite the relatively small size of the nation, there are a large number of distinct English regional accents. Those with particularly strong accents may not be easily understood elsewhere in the country. The two traditional symbols of England are the St. George's cross (the English flag) and the Three Lions coat of arms (see above), both derived from the great Norman powers that formed the monarchy  the Cross of Aquitaine and the Lions of Anjou. The three lions were first definitely used by Richard I (Richard the Lionheart) in the late 12th century (although it is also possible that Henry I may have bestowed it on his son Henry before then). Historian Simon Schama has argued that the Three Lions are the true symbol of England because the English throne descended down the Angevin line. A red cross acted as a symbol for many Crusaders in the 12th and 13th centuries. It became associated with St George and England, along with other countries and cities (such as Georgia, Milan and the Republic of Genoa), which claimed him as their patron saint and used his cross as a banner. It remained in national use until 1707, when the Union Flag (which English and Scottish ships had used at sea since 1606) was adopted for all purposes to unite the whole of Great Britain under a common flag. The flag of England no longer has much of an official role, but it is widely flown by Church of England properties and at sporting events. (Paradoxically, the latter is a fairly recent development; until the late 20th century, it was commonplace for fans of English teams to wave the Union Flag, rather than the St George's Cross). The rose is widely recognised as the national flower of England and is used in a variety of contexts. Predominantly, this is a red rose (which also symbolises Lancashire), such as the badge of the English Rugby Union team. However, a white rose (which also symbolises Yorkshire) or a "tudor rose" (symbolising the end of the War of the Roses) may also be used on different occasions. The Three Lions badge performs a similar role for the English national football team and English national cricket team. "God Save The Queen" (the national anthem for the UK as a whole) is usually played for English sporting events (e.g. football matches), although "Land of Hope and Glory" has also been used as the English anthem for the Commonwealth Games. "Rule Britannia" despite being a song about Britain as a whole was often used for the English national football team when they play against another of the home nations but more recently "God Save The Queen" has been used by both the rugby and football teams. Many believe that English teams should use their own anthems, most popular of which is the use of "Jerusalem".